The Philippine Eagle was named the national bird of the Philippines in 1995. The Philippine Eagle is one of the rarest birds in the world, with an estimated population of fewer than than 500 individuals. The Philippine Eagle was the official mascot for the Southeast Asian Games competition in 2005. These rare eagles have been pushed to the brink of extinction by deforestation, shooting and other human activity. 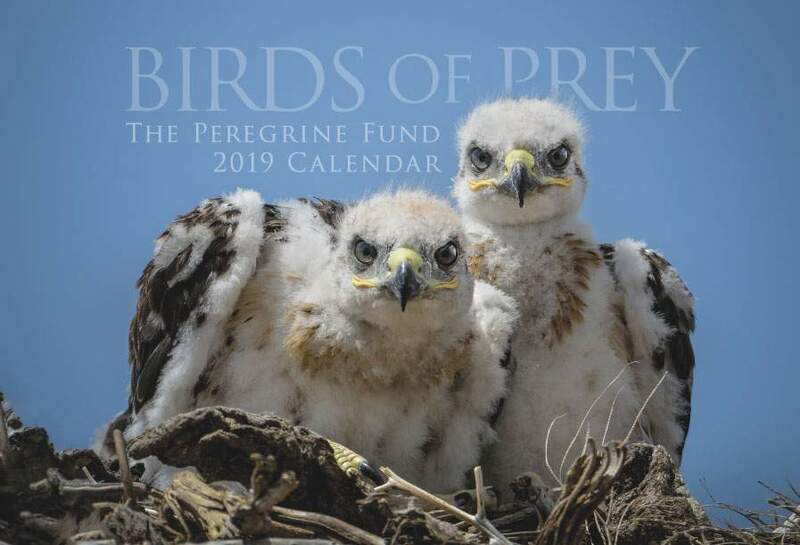 In the 1970s, only a few years after The Peregrine Fund was formed, we began assisting and advising on conservation measures for the Philippine Eagle. Our commitment to help protect this species continues to this day. The best way for us to do this is to provide support and assistance to the Philippine Eagle Foundation. 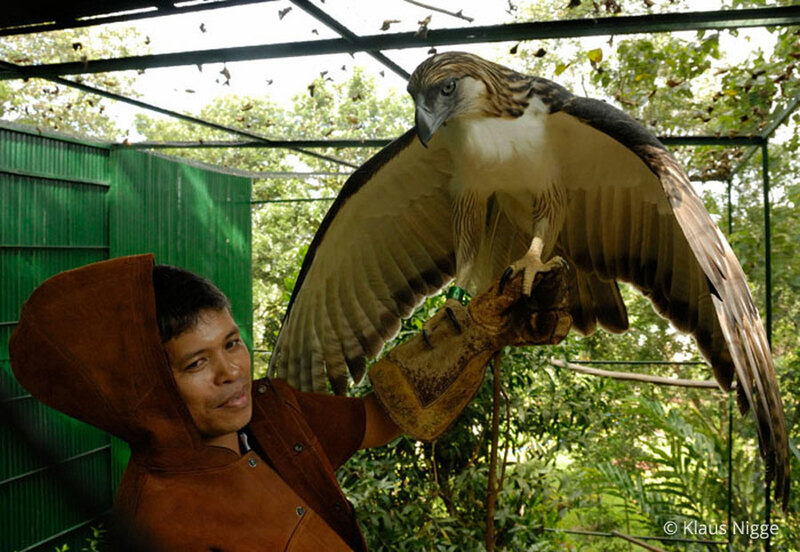 This organization has produced Philippine Eagles through captive breeding and has reintroduced some individuals into remaining fragments of suitable habitat. The foundation released the first captive-bred eagle to the wild in 2004 and has since released several rehabilitated birds. Education in local communities and working with them to develop community-based conservation of critical habitat is also helping to protect this species. The Philippine Eagle, as its name suggests, is found only in the Philippines, an island country in Southeast Asia. While the Philippines consists of more than 7,000 islands, the Philippine Eagle is found on only four of them, all within the northern and eastern regions of the country. 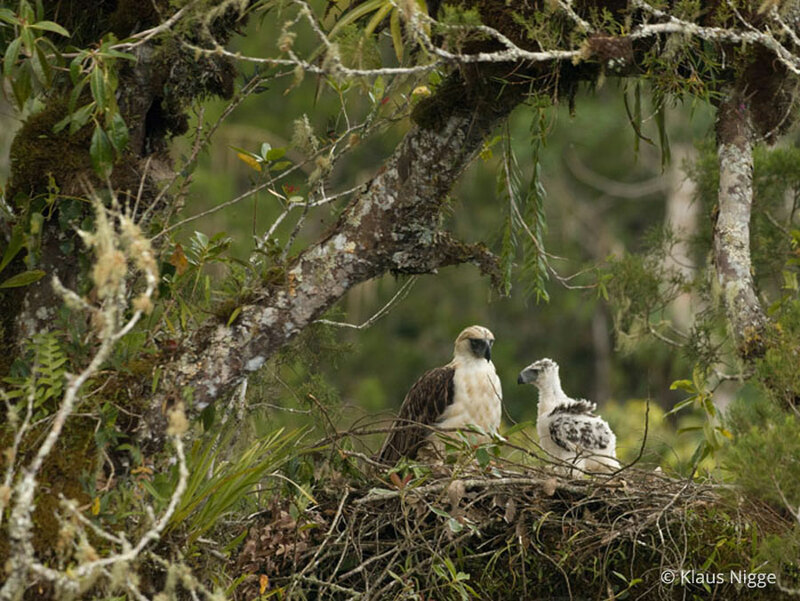 Though the Philippine Eagle may spend time along forest edges, and has even been observed in areas where the forest has been logged, this species is a true forest raptor and relies on pristine primary forest in which to hunt, build its nest and raise its young. It can be found in habitat as low as sea level to around 5,900 feet (1,800 m). However, much of this species' lowland habitat is being destroyed - mainly due to logging and converstion of forest land into agricultural fields. When this happens, of course, the eagles can no longer live there. Lately, they have been more and more restricted to living mainly on moutain slopes, which are generally less at risk because it is more difficult to log or grow crops on a slope than it is in the lowlands. Apart from being one of the largest eagles in the world, it could be argued that the Philippine Eagle is also one of the most striking. It has a massive dark black bill with a tinge of blue, neon yellow feet, and pale gray-blue eyes. Its cottony white belly contrasts with its darker back, and the fringe-like feathers on its legs match the long brown feathers that adorn its head and the back of its neck. Philippine Eagles are diurnal, which means they hunt, fly, build nests, participate in courtship activities and otherwise go about their business during daytime hours. They rest at night. Despite their large size, these eagles tend to be fast and agile in the air, which helps make them very successful hunters. 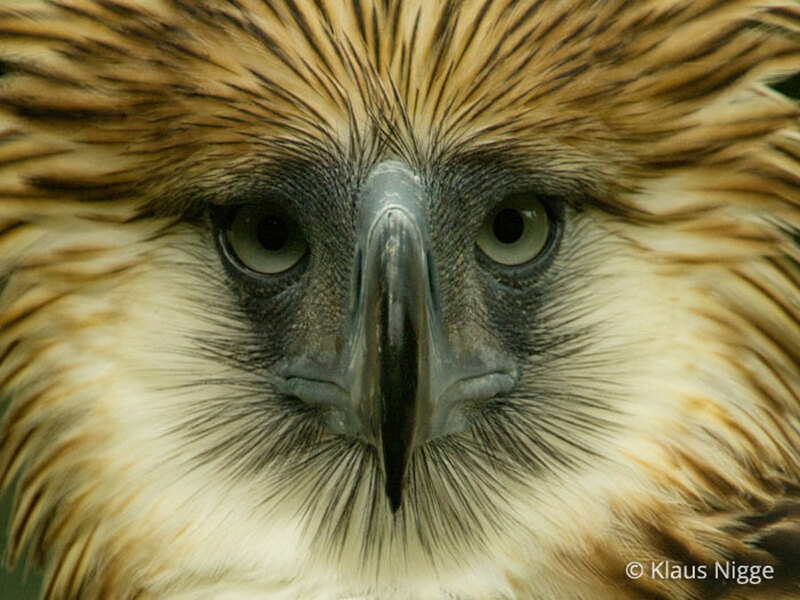 Philippine Eagles, like all top predators, play a very important role in their environment. They are what is known as an umbrella species. Just as several people can stand under one large umbrella and be protected from the rain, so too can many species of wildlife be protected by conserving one species like the Philippine Eagle. To protect the eagles, we must protect the monkeys and civets and other animals they need for food, the plants and animals that monkeys and civets feed on, and the trees that Philippine Eagles nest in, which helps protect the other animals that use these trees for food, shelter, and space. Conserving Philippine Eagles and their habitat automatically provides protection for all the other plants and animals that live there too. Sadly, the Philippine Eagle holds the title for being one of the most endangered raptors in the world. Many factors have contributed to the decline of this stunning bird of prey. 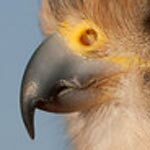 Like the Ridgway's Hawk, this eagle is endemic to an island nation. Wildlife populations on islands are usually more vulnerable to habitat loss and other detrimental actions simply because they have nowhere else to go. After all, Philippine Eagles aren't adapted to flying long distances over the ocean, and they most definitely cannot swim. As more and more forest is cut, they are left with fewer and fewer places to go. This is creating problems for adult eagles who lose vital nesting trees and prey to chainsaws and bulldozers. But it is also a problem for young birds just starting out. Once they leave their parent's territory, they must go in search of a new place to live, find a mate and settle down. However, there are fewer and fewer places to choose from. This could mean that many of the young birds don't survive as they might not find enough food to eat or healthy places to live. After all, where forest has been cut down, people can usually be found. When these eagles come into contact with humans they are sometimes shot and killed, or they may be captured for private and public display. According to the IUCN, these massive eagles might also get killed or injured when the fall into traps or snares meant for other species, such as wild pigs! This critically endangered raptor needs our help now more than ever! Though previously known as the Monkey-eating Eagle, this is a misnomer. Philippine Eagles do eat monkeys, but they also prey on a whole host of animals, both large and small. They have been known to hunt bats, civets, flying squirrels, and macaques. They also eat birds, including other birds of prey, snakes and lizards. 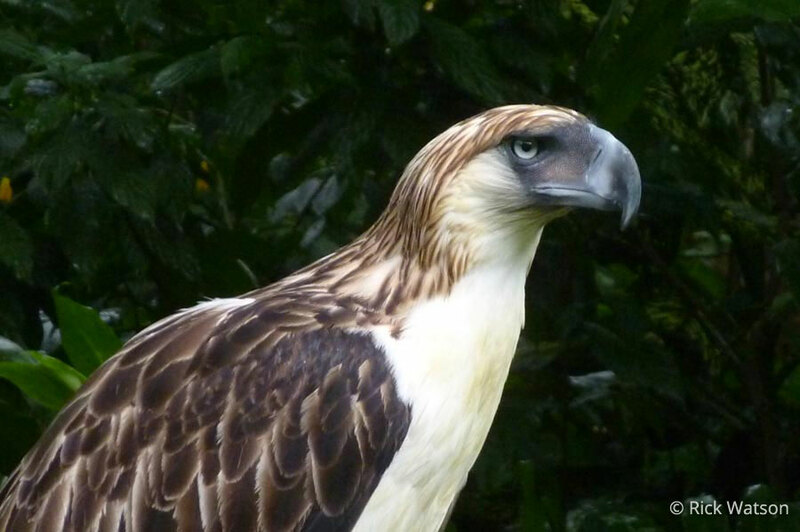 The diet of a Philippine Eagle varies depending on the island it lives on. Prey found in abundance on one island might be scarce or nonexistent on another. Philippine Eagles engage in a number of hunting strategies to score a meal. Sometimes they simply sit and wait until prey is spotted, or they fly from perch to perch through the canopy. They have also been known to probe dense tangles and knotholes in trees in search of something tasty to eat. One of the most interesting strategies the Phillipine Eagle engages in is pair hunting. Simply put, one member of the pair distracts the prey while the other attacks it from behind. Even though Phillipine Eagles are large, powerful hunters, any time they go after prey, they are putting themselves in danger. Fast flight through dense forests can result in bumps and scrapes, but even more importantly, prey animals can and do fight back. 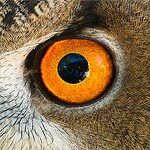 This is especially hazardous when hunting larger prey whose strength and weight definitely put the Philippine Eagle to the test. Scientists have documented eagles being injured by monkeys and other prey animals. For an animal in the wild, even a seemingly small injury can become life threatening if it gets infected or hinders the bird from flying or hunting. Like the Harpy Eagle, Philippine Eagles are believed to stay with the same mate for their entire lives. However, if their mate is killed, they will search for a new partner, though in the case of the Philippine Eagle, finding a new mate might be getting harder and harder to do. Philippine Eagles construct huge stick nests that they build high in the main fork of a tree, often on a platform of ferns and orchids. Every other year, the female lays one large white egg, which must be incubated for about 2 months. When the chick hatches, it looks like a big-headed, big-footed ball of cotton. During the first several weeks, the chick cannot thermoregulate, or control its own body temperature.Both the male and the female take turns protecting their young from rain or sun, heat or cold. In a few weeks, the young bird is just as beautiful (and in proportion) as its parents. At around five months, it will be as big as they are, too. Because the chick grows quickly, it needs to eat a lot. The parents bring prey to the nest and at first, they tear off small pieces of meat for the chick. Later, as the chick grows, it is able to tear off and eat the meat on its own. At around 4-5 months of age, the young eagle fledges, or flies for the first time. In preparation for its first flights, it first "branches out" from the nest. This means that it will begin to walk on the branches close to its nest, practice jumping from branch to branch, and flap its wings vigorously while clutching onto a branch, all in preparation for the big day. Though its first few flights might be shaky and awkward, it will fly almost as well as its parents after only a few days. After the young chick leaves the nest, it remains dependent on its parents for up to 17 months. Because of the long dependency period of their offspring, Philippine Eagles usually breed only once every two to three years. However, pairs that lose an egg or chick generally will try again the next year. Philippine Eagles reach adulthood at 5-7 years of age. The World Center for Birds of Prey offers fun ways to learn about raptors. Interactive activities, tours, interesting videos and a children's room with activities from coloring sheets and quizzes to costumes and a touch table are available for the curious mind. We also have several different birds of prey on display year-round. Come for a visit, where our knowledgeable staff and volunteers are on hand to answer any questions you may have about Philippine Eagles or other raptors.